When creating a homemade pantry, if I was looking for the first thing to make that could provide countless opportunities to quickly concoct something soothing and delicious, I would absolutely vote for homemade stock. Whether you want to make a pot of soup, simmer a rice pilaf, throw together a fast yet full-flavored pan-sauce, or slow-cook classic roux-based gravy, homemade stock is one of those truly pivotal components essential to the quality of a finished dish. When making chicken stock, I like to add a large stewing hen that’s been sawed in half by my butcher. Although not necessary, because the flesh is more mature, a stewing hen naturally adds more depth of flavor. Remove the baking sheets from the oven and scrape all the browned ingredients into a tall 16-quart stockpot. Working with one at a time, place a baking sheet directly on the stove burner and pour in some boiling water. Turn the heat to low and, using the flat edge of a wooden spatula, scrape any caramelized bits of chicken and onions off the bottom of the sheet. Carefully pour this flavorful liquid into the stockpot and add the remaining ingredients, along with enough cold water to generously cover the solids by at least 2 inches. Bring the mixture to a boil, then reduce the heat and simmer gently, with the cover ajar, for 2 hours, occasionally skimming off any scum that rises to the surface. Carefully remove the hen (if using) and allow it to become cool enough to handle. Remove the meat, set aside for another use, and return the skin and bones to the simmering broth along with some more fresh vegetables. Continue to simmer with the cover ajar for 1 more hour. Uncover the pot and continue to simmer, very gently, for another 1 to 3 hours to reduce and concentrate the flavors. During this time, occasionally press down on the solids to extract any remaining goodness. 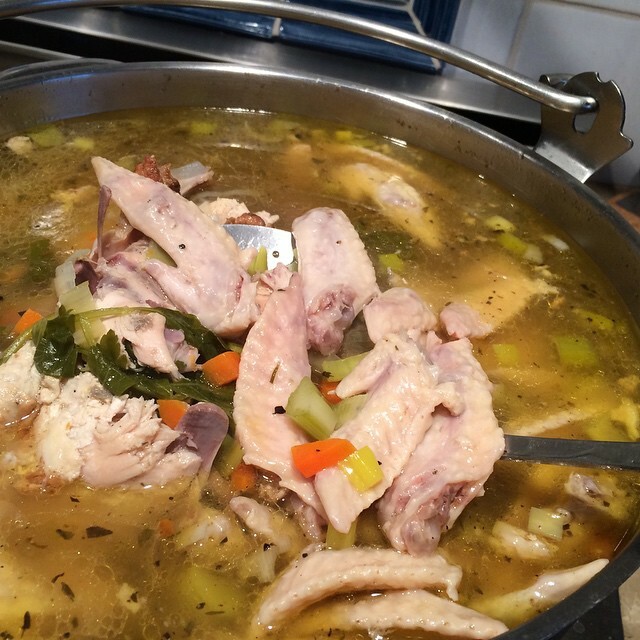 Allow the stock to cool with the solids, off the heat. Place a large sturdy triple mesh sieve over an extra-large bowl and strain the stock into the bowl while you discard the solids from the colander. Clean the stockpot and pour the stock through a fine-mesh sieve back into the pot. Clean the bowl and pour the strained stock back into the bowl and cover well with plastic wrap. Refrigerate the stock for 48 hours to allow all the fat to solidify and rise to the top of the bowl. Use a large shallow spoon to scoop off the thick yellow layer of congealed fat on top of the chilled gelatinous stock. At this point you can either season the stock with salt and pepper to taste and use it now, in your recipe, or divide it among labeled heavy-duty freezer container and freeze it for future use. (Don’t season the stock until you know its ultimate use.) You can also reduce it further which will concentrate the flavors even more (see timing and storing information below). Again, don’t salt the liquid until after simmering to avoid over seasoning. Stock can be refrigerated for up to three days before using, if kept very cold. If freezer space is an issue, after removing all the fat, reduce the stock to ½ its original volume (or even less) and, once cool, freeze. To use the thawed stock “concentrate,” add an equal amount of water. If you don’t want all your plastic tubs to be in the freezer, once the stock is frozen, pop it out of its container and place the frozen stock in a sealed heavy-duty plastic bag. Place back in the freezer until needed.